Recently I had a friend suggest the idea of fashion illustration to me. When I was a little girl I used to copy pictures of fashion models out of magazines and make my own books out of them. I kept a lot of my old art work from when I was young and I found this little book of my fashion drawings which makes me laugh so hard! I don't know what is funnier, the weird title I gave my book, the 80's clothing the women are wearing, or the quirky face (top left)! I literally hadn't thought about the idea of fashion illustration since I was probably 10 years old until now! The thought of combining two of my loves, fashion and drawing, got me excited. I quickly set out to try my hand at it as an adult and bought some fresh new art supplies to really get me jazzed up. I just LOVE brand new art supplies, there is nothing better!! I thought a lot about how I wanted my illustrations to look before I started. 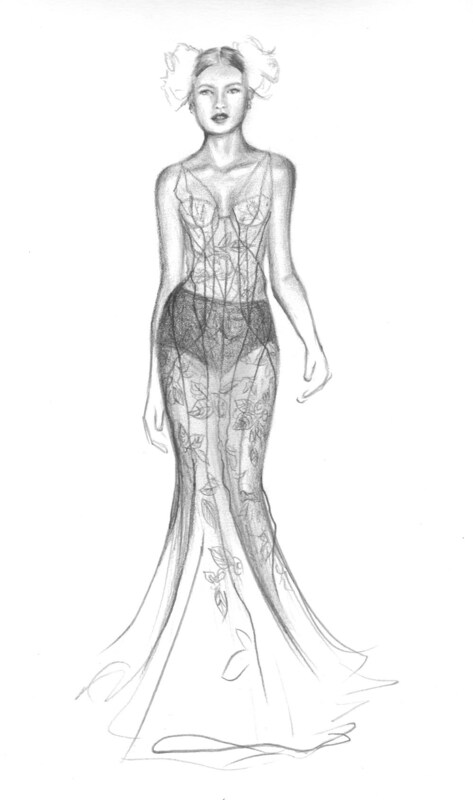 Then I looked for an inspirational photo to work from and found a beautiful Marchesa gown that I wanted to draw. I loved all that was going on in the dress and the styling of the model. I first did a pencil drawing of the model, scanned it, and then I printed it out several times and experimented with how I was going to do the background before I committed to anything on my good paper. Unlike working digitally on photoshop, if you mess up, you might just ruin your entire piece so its always a good idea to do some trial runs first. This is where I landed. Since her dress was so detailed with so much going on in it, I went with a more simple background. I can't escape gold these days (or birds, for that matter), and I also find the circular shape surrounding a subject so comforting so these things were once again incorporated in the background. I used guache, acrylic, and pen and ink to complete the design and frame her face. I had SO much fun doing this illustration and I will continue to explore fashion illustration and see where it takes me. I think its good to sometimes revisit an old idea in a new decade, you may find that you've dug up an old treasure thats been buried with years and time, but once its dusted off, it feels new and wonderful! !